Each month we host a Graphic Novel Book Club meeting, open to all, during which we hang out and informally discuss a featured graphic novel. 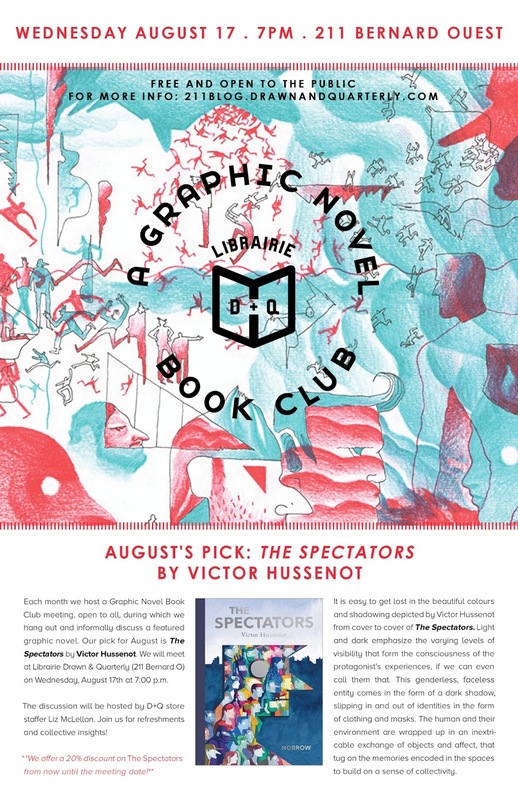 Our pick for August is THE SPECTATORS by Victor Hussenot. We will meet at Librairie Drawn & Quarterly on Wednesday, August 17th at 7:00 p.m.
Join D+Q store staffer Liz McLellan for a lively discussion (and beers!). It is easy to get lost in the beautiful colours and shadowing depicted by Victor Hussenot from cover to cover of The Spectators. The choice of watercolour as a medium allows him to create depth and dimension, which just so happens to be the focus of the narrative. Light and darkness emphasize the varying levels of visibility that form the consciousness of the protagonist's experiences, if we can even call them that. This genderless faceless entity comes in the form of a dark shadow, slipping in and out of identities in the form of clothing and masks. Hussenot takes it to the next level: the human becomes buildings,and the buildings become them. The human and their environment are wrapped up in an inextricable exchange of objects and affect, that tug on the memories encoded in the spaces to build on a sense of collectivity. We offer you a 20% discount on THE SPECTATORS from now until the meeting date!